Incredible Restorations is a certified indoor air quality and mold removal company. We use state-of-the-art equipment to inspect both commercial and residential properties. We specialize in investigating and remediating mold and water damage. Once a mold abatement project is complete, we build your property back to together. We work across the entire Vancouver lower mainland serving property management firms, homeowners. For over 20 years, we have been providing environmental services obtaining fast and thorough results, resulting in a smooth and seamless transition back to your normal life. At Incredible Restorations we have dealt with hundreds of properties affected by mold. Our mold remediation experts are certified environmental professionals able to detect and effectively restore all affected areas by mold, minimizing further damage for your property, and maintaining your property value. 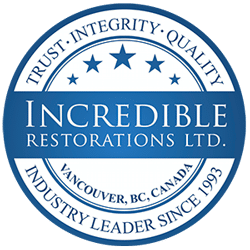 Call Incredible Restorations immediately, we are available 24/7 to assist you mold remediation, prepared with the knowledge and state-of-the-art tools to rapidly mitigate the issue. It’s our duty to assist you with the highest level of professionalism and customer service. We are very understanding of these stressful situations when mold is damaging your property’s building materials, furniture, and prized possessions. As a recognized premium restoration service provider, it’s our responsibility to deliver excellent service throughout the mitigation and rebuilding of your home.